Have you ever looked at your plugin list and wondered whether you actually using it anywhere? Or perhaps deactivated a plugin or swopped themes without realising that you now have a dead shortcode on a page or post somewhere telling the world that you really aren’t on top of things in your websites. Yes well, it happens. This little plugin may help. amr-shortcodes searchs through your published or future posts, pages etc looking for shortcodes. It then lists the pages and the shortcodes that appear on them, with handly little links to edit the post. 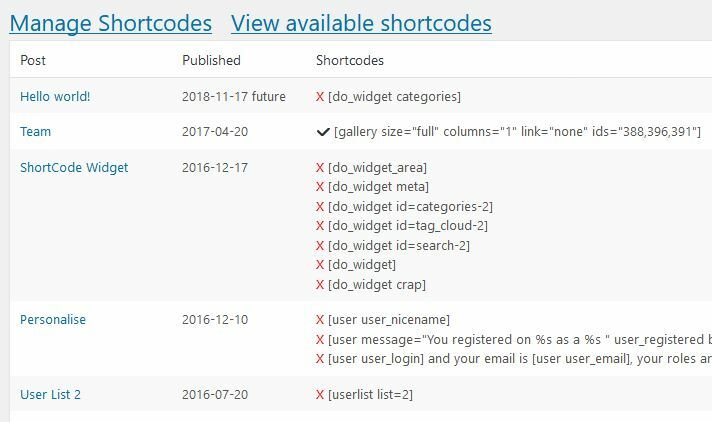 It will also flag with a red cross if wordpress does not know about that shortcode anymore – ie the shortcode is dead and there is no function that will switch out the shortcode text for some wonderful other text. It does not automatically delete the dead text, because you reallly should look at the page or post and delete any surrounding text as well that may no longer be relevant. And then, just because it might be interesting, I added a tab so you can see the available shortcodes.